By Jim Bisognani for Numismatic Guaranty Corporation…. Long Beach Expo—Heritage Signature Auction Provides Punch; Coins Priced in the “Wheelhouse” Are Surging. The just-concluded Long Beach Expo Coin Show, referred to as the “summer session” even though the official start of the summer season is a few weeks away, was a rousing success no matter what you call it. Attendance was solid; collectors were scouring the bourse floor intent on making acquisitions. Dealers were busy with pre-coin-show activities and most reported well above average sales. According to Green, dealers were very active buying for the upcoming Baltimore, Summer FUN and ANA shows later this summer. Brian Hodge of LMRC relayed to me that their highlight NGC acquisition at the show was a rare 1853 Moffat $20 graded NGC MS 61 and their highlight NGC sale in Long Beach was a 1795 Draped Bust Half Eagle graded NGC AU 53. While the convention floor was buzzing with considerable activity, the Long Beach Signature Auction by Heritage was quite the draw and cause for commotion in the port of Long Beach venue. 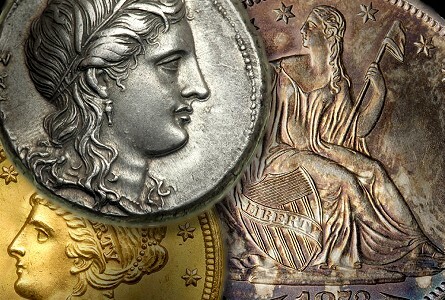 This summer Signature Auction by Heritage showcased the exceptional depth and strength in the numismatic arena. As we go to press, the sale is at $17 million and counting. This auction’s total realized is also very significant. By my research, the last time a Long Beach signature sale eclipsed this dollar amount was in September 2013. However, this just-concluded summer sale ranks right up there with the record setting 2008 June Long Beach sale which generated $19.1 million. I remember the sale well; that summer session was just a few short months before the financial crisis and mortgage market collapse which brought our economy and the world’s to the brink in September of that year. Luckily we rebounded rather well and our beloved coin market has come a long way since then. Interestingly that June 2008 sale had slightly over 7,500 lots and the average price per lot was a little over $2,500 per coin. Fifty-seven percent of the coins sold were in the under $1,000 price point and 37% resided in the $1,000 to $10,000 category. The just-concluded sale in June 2015 featured approximately 4,400 lots boosting the average price realized to approximately $3,900 per lot—nearly a 55% increase over the prices realized in the 2008 Summer Signature sale. Perhaps more telling, this 2015 sale reveals the figures are basically reversed. Only 35% of the coins sold fell in the under $1,000 category whereas 60% were in the $1,000 to $10,000 category. Perhaps a bit of surprise is that the five and six figure coins sold were virtually in the same percentage territory, claiming 4.4% of the lots sold in 2008 versus just a shade over 5% at the just concluded 2015 sale. While silver dollars and double eagles accounted for the lions share within these price parameters, there were some superb better date type coins and key date collector coins that fell right in the popular “wheelhouse” price point. By reestablishing strength and vitality in the marketplace, collectors and investors are once again inspired, targeting rarities and key coins in high-grade. NGC-certified coins performed admirably at this Southern California venue. Below are a group of NGC-certified coins from the Heritage Long Beach Signature sale: key dates, first and last years of issue and scarce varieties. All the coins are highly collectible and in great demand. 1909-S Indian Cent NGC MS 63 RB $1,528. The final year of the popular Indian series and the rarer of the two San Francisco Branch Mint deliveries is a coin with superb eye appeal, collectability and is always in great demand. 1851 Three Cent Silver NGC MS 67 $6,643. Wow, first year of issue and just an amazing, totally dazzling white gem! 1912-S Liberty Nickel NGC MS 63 $2,350. Solid eye appeal, one of the key dates to the Liberty Nickel series and the only San Francisco Mint delivery for this final collectible year coin. 1916/16 Buffalo Nickel Doubled Die Obverse NGC VG 10 $8,813. For the Buffalo specialist, the doubled die never goes out of style. This is a premium low-grade example. 1795 Flowing Hair Half Dime NGC VF 35 $3,760. Highly desirable type coin of the Flowing Hair variety and by far the most affordable. This example is totally original and has wonderful eye appeal. Another great collector coin! 1800 Draped Bust Dime NGC AU 58 $8,813. A great bargain for the dime collector or early silver type specialist. 1892 Barber Dime NGC MS 67 $2,585. First year issue with the pizzazz and punch that is so infrequently encountered on this issue. 1932 Washington Quarter NGC MS 66 $3,525. Sublime eye appeal endows this inaugural Washington Quarter! Another record price! 1937 Washington Quarter NGC MS 68 $6,463. The finest known and just a dazzling representative. Worthy of the record price! Jim Bisognani has written extensively on US coin market trends and values and was the market analyst and writer for a major pricing guide for many years. He frequently attends major coin shows and auctions. Next articleDave Harper Discusses the Demise of Circulation Finds. Video: 7:28.